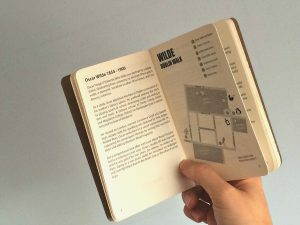 When the 1st edition of Romping through Ulysses sold out, we decided to include maps in the next edition. It was important for us to inspire you to get out and have your own adventure in Dublin and to follow in the footsteps of Joyce, Stoker and Wilde. We created routes that take you to places from the original books and the authors’ life. 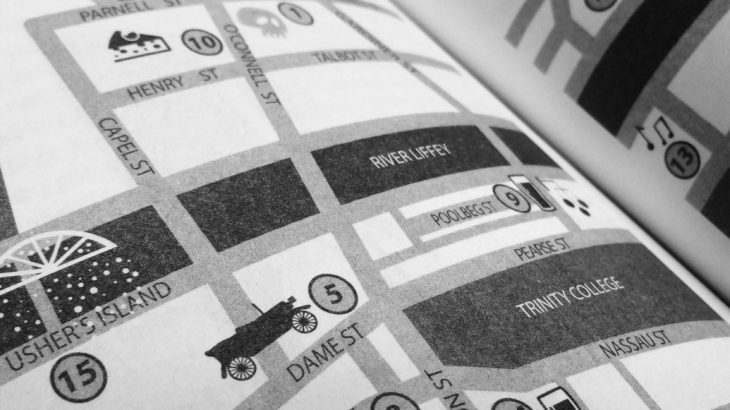 Each map includes fun icons that give you clues to the hidden treasure in Victorian and Edwardian literary Dublin. We’ve also designed maps to the locations in the story, from the Dublin of Ulysses to the London of Dorian Gray, so you can experience the characters’ journeys. As you dive deeper into the city, you become part of its stories. Why not look for Bram Stoker’s bust in St Ann’s Church or spot the plaque that marks Oscar Wilde’s birthplace or the ghost sign of Finn’s Hotel where Nora Barnacle was working when she met her future husband, James Joyce! Find out more about the places to explore in our Romping through Irish Literature collection. This blog post is by Niall, our Victorian poster boy with a versatile face, great hair and mischievous left eyebrow. He likes to twirl his moustache as he dreams up visual puns. Bram Stoker, Dracula, Dublin Trip, Dubliners, Irish Writers, James Joyce, Oscar Wilde, The Picture of Dorian Gray, Ulysses Books, Bram Stoker, City guide, Dublin, Dublin trip, Dubliners, Edwardian, Famous Irish Writers, Finn's Hotel, Irish Literature, Irish Writers, James Joyce, literary adventure, literary gifts, literary maps, literary travel, London, map, Nora Barnacle, Oscar Wilde, The Picture of Dorian Gray, Tintin, Ulysses, Victorian. permalink. Dear Ruth, our guides and other goodies are available in stores across Dublin. You can find our stockists on http://www.atitagain.ie/stockists. Unfortunately, we don’t have stockists in the UK yet. We hope you enjoy your trip to Dublin and we would love to hear about your literary adventures.